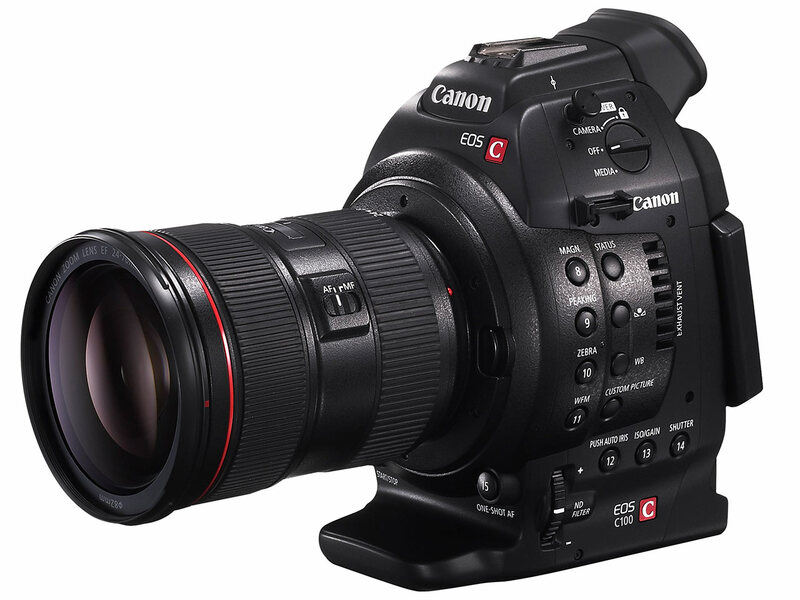 Canon has announced a the EOS C100, a 'budget' addition to its Cinema EOS range of professional video cameras. Designed for independent videographers, the C100 offers the same core technology as the C300, including its 8.3MP Super 35mm image sensor, in a smaller package. Its EF lens mount means it's compatible with all of Canon's SLR lenses, as well as the company's specialist Cinema EOS optics. The C100 records 1920 x 1080 Full HD movies to SD cards at a bitrate of 24Mbps, offers an ISO range of 320-20000, and can output uncompressed video directly to external recorders. It will be available from November 2012 at a price of $7,999. London, UK, 29 August 2012 – Canon today adds to the Cinema EOS System with the launch of the new EOS C100 – a compact, versatile interchangeable-lens professional video camera designed for independent videographers. Based on the core performance of the acclaimed EOS C300, the new model combines impressive hardware specifications with a range of new automatic features – making it ideal for professionals who shoot without a crew, or EOS videographers entering the Cinema EOS System for the first time. range and proven low light performance, while extensive NLE support makes it suitable for a wide range of users and production purposes. With Canon’s EF mount users have immediate access to over 60 class-leading EF lenses, as well as the freedom to experiment with the company’s expanding EF Cinema Lens line-up. Designed to offer leading quality and portability, the EOS C100 features a specification designed around the needs of single operators. Its advanced imaging system utilises the widely-used AVCHD codec, with the CMOS sensor recording 1920x1080 (Full HD) resolution video to SD cards1 at 24Mbps with 4:2:0 colour sampling – delivering sharp, vivid, professional-quality video. Uncompressed video can also be output directly to external recorders via an integrated HDMI terminal, complete with embedded timecode data. As well as full manual control, the EOS C100 integrates a range of new automatic features to support independent operators such as documentary makers or news shooters. A new One Shot AF button enables users to instantly check focus, with the central image area automatically checked prior to recording. Push Auto Iris evaluates exposure and makes any required adjustments before shooting, while new Auto White Balance uses the power of Canon’s DIGIC DV III image processor to detect and balance colour information – allowing operators to focus on the story in front of them. or resolution of footage before transferring or web hosting. users to enjoy both versatility and comfort – even during all-day use. A large, high quality 8.8cm (3.5”) Vari-angle LCD is situated on the rear of the camera body, which can be manoeuvred to offer easy access to a range of function buttons situated behind the display. An adjustable handgrip also offers DSLR-like ergonomics during handheld shooting, and can be removed altogether for shooting in tight spaces or as part of a multi-camera rig. The camera’s button layout also has been designed taking user feedback into account, with all recording buttons now featuring red markings for added convenience during shooting. Up to 15 assignable buttons also provide high levels of customisation, allowing each user to optimise camera operation to suit their own requirements. The EOS C100 also offers professionally-optimised audio and connectivity, supporting the capture of Dolby Digital AC3 or 16-bit Linear PCM audio at 48 kHz – the high quality signal required for professional broadcast content. A stereo microphone is built into the camera’s detachable handle, alongside audio control dials and two XLR terminals which enable users to connect to external microphones and other sources. The camera also features a new lockable HDMI terminal that ensures cables remain securely attached to the input during shooting2. In addition, Canon’s hugely-popular EF lens series for DSLRs offers virtually unlimited creative freedom, with options to meet any budgetary requirement. The EF-S range comprises a selection of compact, lightweight zoom lenses that merge high image quality with affordable pricing, while the full-frame EF lens line-up offers outstanding quality and flexibility – utilising luxury, class-leading optics in a range of focal length options ranging from 8mm to 800mm. Since the launch of the EOS System in 1987 over 70 million EF lenses have been manufactured, a measure of the system’s unparalleled quality, popularity, and ability to meet the needs of all kinds of photography and video users. How would this compare to the 5dmk3 for video ? I'm hoping that the Black Magic camera breaks the hegemony that keeps the prices for these cameras so high. I wonder what the profit multiple is? I would think new R&D costs are fairly low at this point in the digital imaging life cycle. For my taste Canon is lately focusing too much the video business. Right, video is a fad and will be gone soon. Who in their right mind would sit and watch videos ? 1. Canon does not manufacture 3-chip camcorders. Not even 3-chip still cameras, as far as I know. Almost nobody else out there do those any more, anyhow. 2. The EOS C100 is not a cinematography camera. Rather, it is a standard video camera that can record standard 1080p video at a maximum frame rate of 30fps, and use the consumer-grade 24Mb/sec AVCHD codec. You can get hundreds of digital cameras that can do all this as well, some priced as low as US$100-200. 3. I would love to see the rate cards of wedding guys buying this camera with the lenses and accessories for around $20,000 and try to have a decent ROI on their purchase. 4. By the time you put on the top handle, something you need to do if you also want to record audio and not just video, you will be at 3 pounds of weight or more w/o the lens. Not exactly "light weight" in most folks' books for a 1080p30 video-corder. But otherwise -- I'm all with you on this, DonnieG. And Sony, Panasonic, Ikegami, etc. all make 3 chip cameras..which are still the standard in professional videography. Regarding the second point, the C100 is for narrative filmmaking, not a "standard video camera." With a "standard video camera" you have zoom and auto-focus lenses. The target market for a camera like this is schools, independent film, documentary work, B camera, etc. Thanks Shogi for clearing that up for us. Now, as for my referring to the C100 as a cinematography camera, I chose to use that term based on the size of the camera's super 35 CMOS chip as compared to the tiny chips used in traditional video gear. So now, in additional to having extensive lens choices for professional one person video applications, the camera can offer up cinema quality depth of field control, and comes complete, right out of the box with everything you need to start recording, once you attach your favorite lens to the front and load your SD media. No cages or add on power sources or accessory monitors required. I find that significant for the price, others might not. But then I'm looking for results beyond the typical facebook, etc., post. Like I said before, Shogi.... Canon does not make/sell any "3-chip" cameras now. Nobody else does, either. It's a single-chip CMOS world out there now, you know. Nor do the others you had mentioned. Sorry. They WERE making them before, so you are partially right, I suppose. Best get an ILC or DSLR for under $1,000 -- they all can do 1080p at 30fps to a 24Mb/sec AVCHD codec. No reason to pay a $7,000 surcharge for the Canon name. Just my 2 cents' worth, mind you. If Francis Carver had bothered to read from the Canon pro camcorder product page he would have discovered that Canon has no less than four 3 chip cameras. They are the XF305, XF300, XHG1S, and XHA1S. All currently in production. Now just maybe Francis lives in a country where Canon doesn't make these products available. If that's the case, then of course he wouldn't be aware of these high end Canon products. Hi to all. I am sorry if I am wrong but I take it that Donnie G is not a videographer yet. Probably a photographer already. If that is the case, I am afraid that his comments are somehow out of place. Excuse me for being too direct, but I am fed up with slideshows passing as videos. Still photography is an art in itself, but it is definitely NOT video. Video is totally different than photography. Both are equal unique and fantastic though. With you on that, Amandecido. It is fantastic that some folks out there would take a single CMOS sensor camera to be a 3-chip camera, like it was a 3-chip CCD sensor with prism something from the glory days. Wow.... But I guess some of us pick our cameras based on the number of chips it has, that must be it, surely. The more, the merrier, as that thinking goes. Talking about overpriced cameras... Bunch of people here stated the alternatives and stil some people keep talking about 1lbs less, when obviously this kind of camera (and the competition) will be put on rigs and handled by a team. No excuses, Canon is charging premium and sadly, some people will pay just for the brand. But the only good thing I can see here, is the new lenses. Geez, those are gorgeous lenses. Blackmagic Cinema Camera. 2.5K RAW. Yes, RAW! 13 stops of DR. Full copy of Davinci Resolve. Canon, Zeiss lenses. Use standard SSDs instead of custom media. $3,000. No brainer. Seems like Blackmagic Design is once again promising that they will indeed make at least a few dozens of the camera you are talking about, but after setting various delivery dates this year and breaking all of them, I would not hold out much hope for the BCC to actually happen. You know, for real. Cameras are already going out for reviews. Shipments are to begin Tuesday, September 4. It should be worth the wait! my friend at Singapore have already received one unit of Blackmagic, done the unboxing video and now working on reviewing video. I'm sure Blackmagic Cinema Camera is just days away. Main problem with the Blackmagic camera seems to be, since it has a totally one-off, and rather smallish sensor, there isn't a single lens matching it for coverage. Fisheye and UWA perspective shooting will not be possible with the BCC, unless some optics mfr will come up with something designed specifically for it. Also, it looks like an oversized P&S, ergonomics on it are totally lacking, and so is the viewfinder, come to think of it. But I guess it is at least cheap -- if you consider US$3,000 cheap. So, the latest "deadline" for shipping it is September 4th? Wow, back at NAB they told us it's gonna ship in June. It never ceases to amaze me when people talk about the Quote: "WHOPPING weight of this or that. I have seen guys (wimps) stating Oh this camera is 7 grams lighter than X weighing 234 Grams! The population is becoming very Fat & very weak indeed! "I'll just have a small coffee thanks, I can't lift a big cup all by myself! Price on this latest, boldest Canon attempt at overtaking Hollywood (EOS C100) is exactly the same as what the Sony price is on the NEX-FS700. To the penny. Little bit way too suspicious, I should think. And whereas the EOS C100 by Canon can only do regular HD at a maximum frame-rate of 30fps, and is handicapped by a consumer-grade 24Mbit codec, the Sony camera can record 4K via a connected 4K recorder, can record perfect quality Full-HD slow-mo at 240fps, and has a 28Mb/sec recording codec. Oh yeah -- the Canon does not even have an HD-SDI jack, it seems, whereas the Sony FS700 does. Also, since the EOS-C100 seems to do exactly the same thing for $8,000 than what the Canon EOS C300 does for $16,000, who will be a total fool after this time to spend $16,000 for a C300, when they can get this basic C100 for half the price exactly, I wonder? Where's the proffessional 50Mbps 4:2:2 MXF format????? All professional external video recorders use the locking HD-SDI interface (via locking BNC jacks), something that this Canon EOS C100 cannot seem to do, since it only has a consumer-style HDMI jack. Also, it is pretty lame when you need a tethered external recorder in the year 2012 just to record regular HD video. Probably a dumb question, but how does 1920x1080 relate to 8.3MP? 1920*1080*Bayer filter would be 8.3M sub-pixels, but only 2.1M pixels, yes? Yes, I understand there are 8.3M sub-pixels, once you add all the R, B, and G.
But for "normal" cameras no-one counts sub-pixels (i.e. R + B+ G + G), they count full pixels, yes? For a still camera, they don't count "sub pixels" -- a pixel is a pixel, and half of them are G, 1/4 are B, and 1/4 are R. They then apply a demosaicing algorithm to assign RGB values for each pixel by doing the appropriate interpolation to calculate what the "missing" color values should be for a given pixel are given the values of the nearby pixels with those colors. If all you need is 1080P, though, you can take your 2x2 array and assign that to one final pixel, using the R, (G1+G2)/2, and B values without having to interpolate. It's probably a little more sophisticated than that, but that would be the general idea I think. OK. Sorry if I'm not getting it, but the article and sdyue are referring to this as an 8.3MP sensor, whereas 192081080 only requires 2.1MP. So presumably, each "pixel" in the 192081080 image is made up of a 2x2 set of pixels from the sensor, i.e. 4 full pixels, which are made up o 16 "sub-pixels" (whatever the correct term is) of 8x G, 4 x R, 4 x B. Is there a benefit to doing it that way, as opposed to building a bespoke sensor with 1920x1080 relatively huge pixels? I guess doing it this way, a firmware upgrade might give the capability f taking 3840x2160 images or video. To reduce moire, there is a low pass filter in front of the camera chip, making sure that light that would normally hit 1 pixel alone is spread around- approximately four. By having 4 times the pixel count, you counter the effect of low pass filtering almost completely, giving perfect sharp pixels at 1920x1080. As to who will buy this? Cinema rentals will buy it. Look, it is totally a budget deal if you think about this, you can have the c100 and tons of lenses. Instead of paying 20k for a lens you can get a great lens for 1k-2k for the canon system. Fantastic for budget features and advertisement. Just get an HDSLR or a mirrorless digital camera for $600 to $3,500, and you can use the same $1,000-$2,000 photo lenses on them that you are talking about, LaFonte. When you have budget constraints, none of these Canon Cinema cameras and lenses and external recorders will be particularly budget-friendly for the non-Hollywood producer, I fear. Where I come from everybody is renting cameras for any production. Nobody wants to own anything these days because different production has different needs, things go old very quickly, so you simply rent what you momentarily need. Actually as a rental, this canon would be very much non-Hollywood producer budget-friendly and great and cheaper alternative to Red with far more lenses choices. You must be coming from Los Angeles, New York, or perhaps Chicago (if you are in the USA). In the rest of the country, it is a good idea to actually own a camera, so when you need to shoot something, you have the means to do so. Why would anyone buy this when there is FS700 for that price? "Who wants a WHOPPING 3.7 lbs Sony FS700 [w/o LENS] "
Anyone who wants a better camera than this Canon for the same price? FS700 outspecs in most way. 1080p 240 fps vs 24/25/30p and 50/60i frame rates . Even Nex-5R has better video specs than this Canon .. and yes that's smaller too. "Even Nex-5R has better video specs than this Canon .. and yes that's smaller too." You really have no idea whatsoever what you're talking about do you? You may be getting hung up on frame-rates, but a NEX-5R has nowhere near as good specs as a C100 or C300, nor is it's IQ anywhere near the Canons. Shooting documentary with no crew, a C300 or the new C100 would be a superb choice. who cares about the 1lb.. these cameras are going on rigs and tripods. the external audio solution alone would weight more than 1lb. geez. Only Canon knows what luxury it is that this camera is utilising. And class-leading ? Canon "L" lenses are their "pro" models, while it is debated from time to time it is generally acknowledged that "L" stands for luxury. So as it turns out Canon, myself and I am sure many others know what sort of luxury the camera is utilizing; luxury glass. As for you question, are you asking what class leading means or how the statement is justified? In meaning, it suggests one of more of the specs of the lens are better then or as good as the best examples of those models that share its "class". Generally meaning models that share a similar price and intended use. As for justification, that's easy if it fits the meaning of the statement in any way then it is justified. This is generally true of all logical claims based on empirical and measurable results. This is also generally easily proven or disproved with a little research. It is important to remember that for the claim to true you need only find evidence of at least one class leading spec, regardless of overall performance. Luxury glass -- check. I hope it also comes with Corinthian leather -- another luxury feature I grew to love and demand over the years. Re. the "Class Leading" part -- AFASIK, the Canon EOS Cinema line-up has no competition, sine the other manufacturers' similarly priced professional video cameras all offer higher resolution, better codecs, and so on. Check into Panasonic, Red, Sony, etc. Corinthian leather; agreed that would be best. In a brighter future perhaps more furriers will be involved in lens and camera design as well. Could put you of risk of getting a dab of red paint on the equipment but well worth the risk. The original statement was "class leading optics". I am sure you know this as you are a individual of discriminating taste, but optics can at best only affect resolution not define it. That is why we don't see 20mp lenses. Codecs are even further removed from this equation. Hence there are not any (AFASIK) lenses marketed as AVI compatible (I know that is not strictly speaking a codec, but I am sure you get my point). Codecs and resolution are features of a digital camera recording body and not the optics of the system. Thanks for your advise on other cameras to check into but I am not really in the market for a cinema camera. Film making is not something I do. how come their "Luxury" glass line-up looks more utilitarian and no bling anyways? Sure. But many film makers also do slow motion by lowering the rate to 24... Many much lower priced cameras with interchangeable lenses does 60p... You lose 50% of the detail, especially when you also add x2 tweening. The point was, why did Canon miss that, especially at that price? True, the 35mm large area sensor is an IQ win, but why miss out an otherwise easy-to-implement but very useful when you need it feature? This is quite frustrating since it has most of the features I want but misses out on the simple ones that I *need*. "Film makers" use FILM cameras. Some videographers might end up using these strange-brew Canon jobs, however. You should check up on how many 'films' are shot on real film these days. The vast majority, some 80 percent of "films" are still shot with film cameras, of course. With the digital jobs, the results are iffy and the quality questionable. With film acquisition, you can create a 4K, 5K, even 8K scan today, plus you can scan in the camera negatives 50 or a 100 years from now for even better results. Just look at films and TV shows that were shot with video cameras in the 1960s, 1970s, 1980s, 1990s. Most of it look like hell. Not really, film makers will always use film. It's never obsolete. On the other hand, even if they can afford to buy equipment like this, they wouldn't skimp by buying a budget model. This model is for 5D Mark II or 1D owners to "upgrade" to if they use their cameras more for cinematography. With the expected $1,100 priced Panasonic Lumix DMC-GH3 being able to record Long GOP video at 50Mb/sec and Intraframe at 72Mb/sec in-camera, there will be few fools buying a maximum 24Mbit/sec AVCHD camcorder for EIGHT THOUSAND DOLLARS. Canon has perfected the art of making a company look totally ridiculous. Greedy as hell, too. Just 50i/60i at $7999? No thanks. ... and suddenly, family jewels of 5D and 1D owners are getting smaller. How come DPR did not post the Sony EA50 NEX camera that was just released. Not to mention the 18-200 power zoom. Maybe if they had issued a press release under the CANON name, they would have made it. Considering that the top items on dpReview right now are the Sony NEX-5R announcement AND the dpReview hands on of same, I'd say your CANON "would have made it" conspiracy theory is indicative of some personal problems, which you really should not be airing in front of other people, especially in a large online community. So, it makes more sense to present a 30,000$ cine camera and 1ok lenses than an extesnion of the NEX camera line? That makes a ton of sense to you? But DPR did two items on the Nex 5R, which is in most respects a model update, not radically new. I'm really glad to see these cameras coming out, but I don't understand how the price point is justified. I see few practical improvements over a 5Dii or 5Diii - especially for 3 times the cost. Hollywood studio execs just ordered a double dose of aspirins. $7,999 just let the floor cave in on their studio lot. I think you just spit into your OWN face! canon just spit right into customers face. Yes just what I wanted. 1080p @ 24 Mb/sec. 4:2:0 color. And only options for 24p and 30p recording. All for the "budget" price of just under $8000. Are they hiring NASA engineers now? Because this camera would have been cool about 6 years ago. It is not that NASA engineers don't develop great things. It is just that all of the verification they must do takes a long time to produce a reliable product. In Canon's case I think they just have a bad case of Analysis paralysis. Cmon Canon, how do you want to compete against red, seriously lol ! I'm waiting for GH3 too! nice post, ha-ha! Looks like a good move to me, undermines the BMD Cinema camera a bit, since the C300 is way to much ££ and has the excellent same all important chip. Uncrippled HDMI out if you need it, 50P would be useful. To compare the GH2 for many tasks to this is somewhat silly. This C100 and C300 is silly for many task. The price is close to true digital cinema camera, like Red One, which gives you RAW output and high fps. Try actually putting together a working RED camera kit for £5000. Have you see the cars they drive???? Video and cinema cameras again .. obviously Canon as a company has shifted their focus from DSLRs, disappointing (solely from a DSLR user's perspective). FHD is ok, but only 30p? Sorry, that's a bit too few features for too much bucks. Are you complaining about the lack of CF, because that's not a "feature". It's a video camera. At the same speed, large SD cards cost less than half of what CF cards do, and you can easily fill 20 64 gig cards in a day's shooting. That much CF costs more than the camera. And it's easier to deal with large numbers of SD cards. There's the added bonus of being able to change cards in the field without worrying about a grain of sand in a CF card's connector breaking one of the 60 tiny pins in the camera's CF connector and disabling the camera. $3,000 Blackmagic Cinema Cameras has comparable sensor, better audio inputs, a much better recording codec, a touchscreen LCD, and oh yeah, the BCC records to internal 2.5-inch SSD drive instead of SD flash cards. Nice try, $$$$$ Canon $$$$$. A single 64GB SDXC card will hold over 5 hours of this camera's 24Mbit/s AVCHD video and 16 bit PCM audio output. So if you shoot continuously for an entire 24 hour day, you will only fill 5 64GB cards at the best quality setting. And in that scenario, one hopes you are backing up the card data during the shoot, which you will easily have time to do in triplicate before the next card in series is full. And if you are using the redundancy in the body, recording to duplicate cards, you will therefore only need a maximum of 4 SDXC cards in any scenario. Class 10 will be more than fast enough for this recording format, and your 4 64GB cards will run you about $200 by the time this camera ships. The same capability in CF for the 50Mbps C300 would run you about $800 (twice as many cards at twice the price). The "best codec" attainable with this camera is AVCHD version 1.0 at 24Mbit, which is definitely no broadcast quality anywhere where they use HDTV. In other words, this thing is great for events, such as weddings, funerals, B-days, Bar Mitzvahs, etc, but not for TV broadcasting, let alone theatrical releases. Does this wunder-Canon has rolling shutter and tilts vertical lines when moving, same as normal DSLR? A camer this size generally sits on a tripod and does not pan much. Otherwise, you'd probably see rolling shutter. The spec summary does not mention 120p or 60p shooting, which might reduce the effect. Most of the key feature list can be added in firmware to existing and future Canon DSLRs. Thousands of dollars for a measly few lines of code is not cool. Cinema sensor is completely different type. It don't miss pixels as DSLR in video mode.That's why Digital Cinema camera has sharp output. I wasn't talking about the sensor. It's the same price as a 1DX (hey, what happened to the "thousands of dollars"?) and it's faster. Cameras that do cost less than this one, like a 5D III, also have substantially less processing power. Sorry, but it's your post that "is not cool". But processing power like that is cheap,so it makes you wonder why Canon went cheap with their DSLR's. There are consumer cameras costing much less than $1k that can do >240mp/s. And how long can those consumer cameras sustain that rate for? I just looked at the Nex7 review (I'm assuming that is the camera you are referring to) and it manages 24MP at 10FPS for 1.4 seconds. That's not much of a movie clip. No, I wasn't referring to the NEX 7, since its introduction price was over $1k. I was referring to the A65. This wasn't about sustained speeds though, it was about processors. These cameras are limited in their sustained speeds because of limited buffer depth and secondly the bus speed (A65 doesn't even support extra UHS-I bus speed), not so much processing power. But if you insist turning this into a buffer argument, the 5Dmk3 mentioned by Joseph can store up to 18 RAW frames (4 more than the A65) and a measily 7 RAW+jpeg. The latter is almost half of what the afore mentioned A65 can do. It's only in jpeg mode where the difference becomes huge in favor of the Canon. Weep not, o ye fellow paupers: Canon's own GF10 videocam sells for $1.2k and uses a 2mp sensor. Actually, about 24mbps, or at most 28mbps, is about most people would ever need. Some fuss over hackware to boost the rates, but end up shooting limited action scenes, or defocus backgrounds, so that any advantage is moot. On YT, most viewers bother only to see the 480p 3mbps default versions anyway. To shoot decompressed video brings a whole kaboodle of challenges. More than anything, it's a sort of "union card" to confine the high end of the business to crews with big budgets. To shoot in AVCHD or h.264 MOV should be fine for just about anyone not committed to deliver Pixar-grade special effects. Troj, I didn't realize the A65 had a very similar sensor/performance spec. Regardless of what the actual reason for the lack of ability to continually take advantage of 240+ MP/s rates though, clearly this new camera can do it and no other camera in its price range can. Whether it's buffer, bus, or processor, some hardware changed to allow this camera to do what it can do. It's not as simple as software tweaks. Do people honestly believe that the bitrate of cheaper cameras is the best the hardware can do? Modified firmware has already debunked that for a lot of the popular models.